Flag-waving marchers chanted "China out" and held a banner saying "Defend our sovereign rights." Tensions have flared since hundreds of Chinese vessels appeared near the Manila-held Pag-asa (Thitu) island. The Philippines called the boats' presence "illegal" and President Rodrigo Duterte threatened China with possible military action if it touches the island. But the president has repeatedly said he has no intention of getting into a conflict with the rising power he has courted for trade and investment. Duterte has been criticized at home as being too eager to grow ties with Beijing. 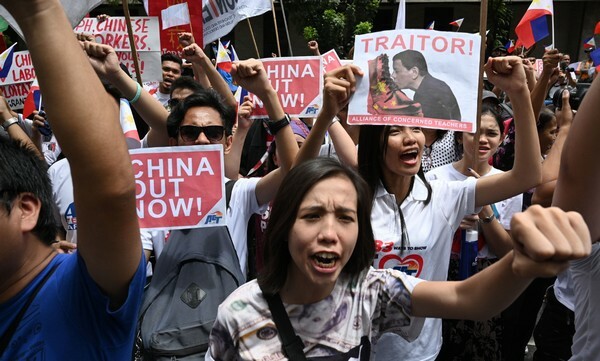 Protesters also voiced simmering unease over the terms of Chinese loans for infrastructure in the Philippines, including a massive dam-building project. China is to loan US$210 million (HK$1.6 billion) toward the construction of the Kaliwa Dam, a project that has been delayed for years. "We cannot allow ... China to control Filipinos and the Philippines' sovereignty," Wilma Quierrez, 53, member of an indigenous rights group, said. "The loan agreement ... will send us into debt trap."